(CHRIS) We got up before 7am, said goodbyes--they took our picture--and drove off. (MATT) They also gave me a ricecake to eat. Plain, dry, and hard. What is it with girls and ricecakes anyway? (CHRIS) Our only stop today (besides to get gas) was Mitchell, SD. We saw the famous Corn Palace, the only one in the world. (Fun fact: the corn murals that cover the walls have to be re-done every year because the corn rots. All the different color corn is grown in SD only.) 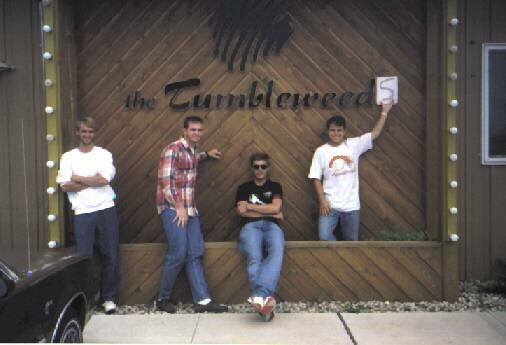 We also took a picture at the Tumbleweed restaurant nearby. Now, we just entered Minnesota. This is all farmland, but seems very nice. We saw some flooding in Sioux City, It's raining now. Annie Bureau, here we come! She's expecting us at 5:30. The Tumbleweeds are back in the East. Look out! Also, Jon and Matt lended their sleeping bags to the girls and slept a bit uncomfortably for their chivalry, Also Matt and Jon went back to the campsite this morning, found our water bag, some poker chips, some tent stakes, and some guy gave them my Pirates hat which I didn't know I had lost. One more thing--We broke our second Ragu glass jar of the trip during last nights madness. Both times Jon left it in the side door well and someone opened the door and broke it. Jon says it's the person's fault who opened the door. The rest of us blame Jon. (MATT) 39th day. Food really is low. We had macaroni and cheese for breakfast and lunch (same meal) and broke down for Doritos earlier. We have canned fruit left, some mashed potatoes, Bisquick, hamburger helper, and enough macaroni and cheese for one more meal. (PB&J is even quite low.) We must keep strength. Must make it to Annie's house. (CHRIS) We got to White Bear Lake, a St. Paul suburb about 6 pm on the 7th. We called Ann and got directions. "Have you eaten yet?" she asked Matt. "No," he replied. "Good." she said,. And there was much rejoicing. (SAM) Annie invited us into her very nice suburban house to meet her mom and her mom's friend, Pat More. Annie's mom was excited to see us as Annie. All the while Annie kept saying, "Christendom right here in my little homie, wow." As the women slaved in the kitchen to make us a great meal, Jon and I took a long hot hot shower (not together, of course.) First shower in 9, count them, 9 days! Matt and Chris went to the store with Annie to buy drinks, cookies, and power ball tickets. No they were not going to be contestants on American Gladiator (although we know they could.) These Powerball tickets were for a $100 million jackpot. The second largest lottery in the country, Soon we were ready to eat a delicious dinner. (CHRIS) We ate Spaghetti and cheese bread. It was so good. We ate alot, because they did not want leftovers. We had really good cookies for dessert. We talked with Ann and the Mrs. for awhile, recounting many of our adventures. Mrs. B. really liked us. We also talked a bit about our plans for our stay in St. Paul. Finally, we decided that Ann would give us a tour of the downtowns of the Twin Cities. She even drove. (SAM) It was very spacious and nice. Our Detroit Boy even said that it looked safe to walk there at night. We saw the outside of the very beautiful cathedral of St. Paul because it was closed. Then we drove to the Mississippi River and walked out on the dock. It was fun and Annie even did a deep thought for our camera. Then we drove around Minneapolis. We found the A and W joint closed so we shook its dust from our feet and went to a gas station to buy ingredients for our own root beer floats. We gave Annie gas money and started back home. Close to her house we saw a fox and a deer. Annie lives in a very nice wooded area. (CHRIS) Then we decided to say rosary. So we walked to the lake, Lake Pleasant. It was only a five minute walk because we cut through someone's yard. There was a nice little beach, swingset, and dock. We went to the end of the dock and prayed. It was really nice out and a very nice lake. It was quiet too until... We brought out the bottle rockets. They were fun and even went off under water. We contemplated "borrowing" a boat. Then it started to drizzle. (SAM) Soooo we walked back to the house along the road. Soon it began to rain harder and we saw lightning. We now sped up to a steady jog, Annie always in the lead. Then it began to rain very hard so Jon and I sprinted to the house while Chris and Matt enjoyed the thick air. (We had had enough high elevation air.) We made it back to the house safe but soaked. After we began to watch some of the tape of our previous adventures. (CHRIS) We watched the 3rd tape of the trip and enjoyed it very much. Ann laughed alot too. I snarfed my root beer float at the part with the coyote in Yosemite; I'm not sure why--it wasn't that funny. Ann was grossed out, but happy because I made her snarf many times at college. We didn't get to sleep until about; 2am.